Welcome to Frosty December! In our case it's rainy and chilly at the moment which means curling up with a nice soft blanket, a cup of hot cocoa, and a good book or two or three. *Grin* Tell me about your favorite comfort read authors or books for rainy or chilly days. Sweet singing in the choir." 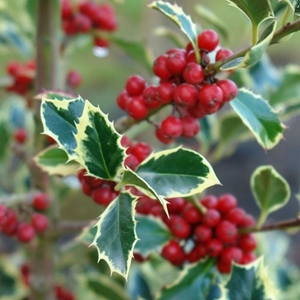 Our Blossom Bookology flower of the month is Holly. There are a number of directions to go for this month's challenge. Read one book per letter using either the title and/or the first or last name of the author. Yes, you can mix it up. You may read a book with the name of the flower, color of the flower in the title, or on the cover. Another possibility is a book which takes place in the time period or flower's country of origin or has some cultural significance and/or symbolism of the flower. The choices are unlimited. This month is full of celebrations beginning with Hanukkah, Advent, St. Nicholas Day, St. Lucia Day, Christmas and Boxing Day, the arrival of Winter as well as Festivus for the rest of us. And we can't forget the wonderful reading tradition in Iceland - Jólabókaflóð. Time to update your Amazon and Goodreads wish lists for the coming holidays as well as next year. Or pay it forward and send a few reads to new homes. We're traveling on Watling way down through Manchester. In the early 1800’s Manchester grew substantially as people immigrated there from Scotland, Wales, and Ireland to work in the growing textile industry. The large influx of working class people gave rise to poverty and discontent and has an interesting history as the meeting place of Marx and Engles. 2018 Year End Wrap Up!